There is no well-established method for dividing the UK into climate zones - no equivalent of the North American USDA plant hardiness climate zones. This article attempts to establish some guidelines on growing apple trees and other fruit trees in the different climate regions of the UK. For commercial growers the UK is essentially a marginal climate. Orchard productivity in countries such as Chile or New Zealand can be 50% or more above what is possible in the UK, largely because of longer and more intense hours of sunlight. This is why commercial tree fruit production in the UK is, for the most part, limited to areas such as Kent, Worcestershire and Herefordshire, where the combination of soil and sunlight makes growing fruit trees on a large scale a viable proposition. However, the gardener or small orchard grower has much more scope, and can benefit from the fickle climate which, perhaps surprisingly, makes the UK one of the best places in the world for growing fruit trees to maximise flavour. Yields tend to be smaller, and the trees are under stress from the climate, and this helps concentrate the flavours. Anyone who has tried a Cox's Orange Pippin grown in the UK with one from, say, New Zealand, or even a home-grown Gala apple compared to an import from Europe, will recognise this. So whilst commercial growers are restricted to the south-east of England, for small-scale growers and gardeners and fruit tree enthusiasts, seeking to grow tree fruits with the best possible flavour, much of the UK is emminently suitable. The main challenges to producing good quality tree fruit in the UK are unsettled weather during spring (which can damage blossom or discourage pollinating insects) and indifferent summers with too little sunlight. Thanks to the Gulf Stream, winter cold is almost never an issue for growing fruit trees in the UK - most fruit tree species evolved in far colder regions than the UK. Thus even in a bad winter, your trees should easily survive in most parts of the UK, although in a bad summer they may not produce much fruit or the fruit may fail to ripen. Here is our guide to UK Climate Zones for growing fruit trees. Remember that these regions are very generalised and your local conditions may put you at a relative advantage (perhaps if you are sheltered from the prevailing weather) or disadvantage (if you are high up, exposed, or very near the coast) to the rest of your region. For example, whilst much of North Yorkshire clearly falls in our second zone (northern England) the sheltered south-east facing slopes of the Howardian hills have a much gentler climate which is more akin to that of central and southern England. You can also find out about the growing conditions for fruit trees in your postcode. This zone (which also includes the Southern Uplands) is the least suitable area for growing tree fruit in the UK. With a few exceptions (Tiree in the Inner Hebrides for example) much of this area has well under 1,000 hours of sunlight per year, and gets too much wind and rain. However with careful choice of site, varieties, and suitable defensive measures, you can be successful in growing fruit trees here. We have corresponded with fruit tree enthusiasts in this region and can offer some advice if necessary. Our variety listings indicate which fruit varieties may be suitable, but please note that this does not mean they will grow and produce fruit half-way up a mountain fully exposed to the Atlantic storms. We have created a collection of fruit trees for north west Scotland which may give you some inspiration. This area includes North and West Yorkshire, Lancashire, Cumbria, and the North-East of England, along with most of Wales, southern Scotland (including the central belt but excluding the Southern Uplands) and Northern Ireland. It also includes Cornwall and some parts of Devon, where rainfall and wind are greater than the rest of the southern UK. (The climate of Cornwall is surprisingly difficult for fruit trees, which is why well-adapted regional varieties such as Cornish Gilliflower remain popular). Growing fruit trees in this region is a little more of a challenge than in Zone 3 - but rest assured, still relatively straightforward. Some parts of this region are too high up, and with the altitude comes colder, wetter and windier weather - which fruit trees do not like. For the rest of this region sunshine levels are a bit less than southern England, and rainfall a bit higher - but in a garden or small orchard situation it is usually possible to offset these difficulties. Most apple and plum varieties will grow perfectly well here, but it helps to pay more attention to the choice of variety than is necessary in southern England. Finding a site with a sunny aspect also helps, as does creating your own micro-climate by growing fruit trees as espaliers and fans on a south-facing wall. Fruits such as peaches, nectarines, and apricots, which prefer a continental climate, will probably not do very well, although growing trees in pots on a warm patio might be successful in a good year. It is worth noting that this area includes one of the best places in the world for growing Damson fruit trees - the Lyth valley to the east of the Lake District. Northern Ireland also has a long tradition of tree fruit production, notably of Bramley apples. This is the area south of a line roughly from Exeter to Flamborough on the Yorkshire coast. It includes all of southern England, East Anglia, the Midlands (including Worcestershire and Gloucestershire), Lincolnshire, and East Yorkshire. From the point of view of growing fruit trees, this region has the best combination of low-rainfall and good levels of sunlight (more than 1400 hours per year) throughout the year, and is well-suited to growing fruit trees in small-scale orchards and gardens. Within this zone, the south coast and Kent have an ideal climate for most tree fruits. Interestingly, the area of Dundee / Tayside in north-east Scotland also just falls into this zone - sunshine and rainfall levels here are on a par with East Yorkshire and Lincolnshire in England. Almost all apples, pears, plums and cherries can be grown successfully here, and fruits requiring hotter continental climates such as apricots, peaches, and nectarines are also possible given care over their situation. Many popular gardening and orchard books refer to the climate zones established by the United States Dept. of Agriculture (USDA) for the North American continent. The USDA hardiness zones run from 1 (very cold) to 11 (very warm). For example most of southern Florida and southern California are Zone 10. New York is Zone 6. Although the USDA zones are very widely used, it is important to recognise that they are based on average annual minimum temperatures. Thus in Miami, Florida, the average coldest temperature in winter is between 1.7C and 4.4C. In contrast the average coldest temperature in Fairbanks, Alaska, will be below minus 45C. One of the problems with the USDA approach is that there is a far more to determining the suitability of a fruit tree for a particular area than the minimum average winter temperature. Other factors such as sunlight hours, length of growing season, and rainfall are important, as these influence not only the growing tree but also the types of pests and diseases which will be prevalent. One of the main diseases of apple trees, scab, is more prevalent in wetter climates. However the USDA zones are useful, particularly at a continental level, because toleration of extreme winter cold determines whether a fruit tree will survive or not - the other climate factors help determine whether it will also thrive. The following table shows the USDA climate zones as applied to areas of Western Europe. Most of the UK is rated in the same zone as Texas and Florida - a striking demonstration of the importance of the Gulf Stream on the climate of Western Europe. Since almost all fruit trees will survive winter temperatures down to minus 12C without problem, for most of the UK winter hardiness is not an issue and gardeners can therefore focus on other climate factors when choosing fruit trees. 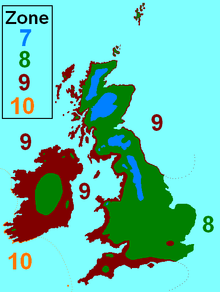 United Kingdom, Ireland Most of the UK and Ireland are Zone 8, with most coastal areas in Zone 9. The Scottish mountains are Zone 7. France, Netherlands, Belgium Almost the whole of France is Zone 8 with the exception of the mountain areas - the Massif Central is Zone 7 whilst parts of the Pyrenees and Alps are Zone 6. Spain, Portugal Central Spain is Zone 8 and Zone 9, whilst some of the southern and western coastal areas are Zone 10. Italy Most of central Italy is Zone 9, whilst the western and southern areas are Zone 10. Germany, Denmark Most of Germany and Denmark are in Zone 7, with the Alpine areas in Zone 6. You might be asking why these European countries, which for the most part seem to be in "colder" zones than the UK, seem to produce so much more apples than the UK? The answer is sunlight and light intensity - or lack of it in the case of the UK. The Gulf Stream which keeps the UK so mild, also brings the cloudy skies which is such a characteristic of our climate. The following map shows a representation of the US hardiness zones applied to the UK, and comes from a useful Wikipedia article about plant hardiness zones. The UK Met Office has a useful climate map feature on their website which allows you to see rainfall, wind and sunshine records for various parts of the UK. Click here to visit their website. Our website also includes a page where you can find out about the growing conditions for fruit trees in your postcode.